3. Who is Responsible for Action on Global Warming? 3.1. 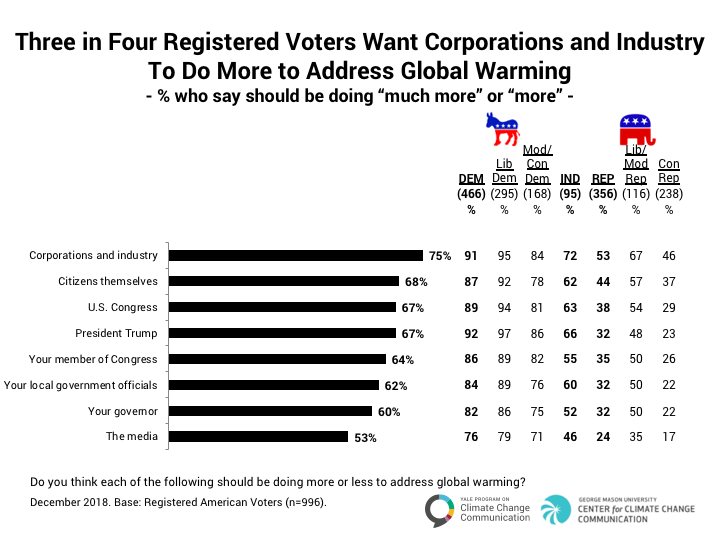 Three in four registered voters want corporations and industry to do more to address global warming. Voters also want more action from citizens and government. Across party lines, a majority of registered voters say corporations and industry should do more to address global warming (75% of all registered voters, 91% of Democrats, 72% of Independents, and 53% of Republicans). Half or more of registered voters, including Democrats, Independents, and liberal/moderate Republicans, but not conservative Republicans, think citizens, the U.S. Congress, their own member of Congress, their local government officials and/or their governor should do more to address global warming. Half or more Democrats and Independents think President Trump and/or the media should do more. 3.2. 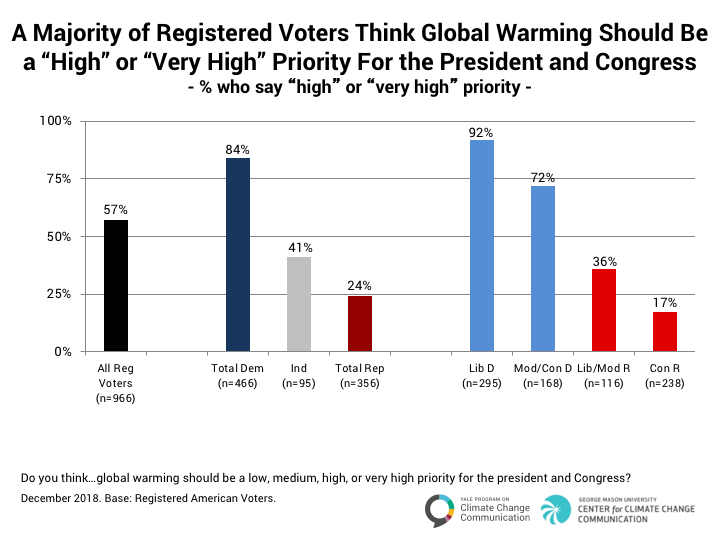 A majority of registered voters think global warming should be a “high” or “very high” priority for the president and Congress. A majority of registered voters (57%) think global warming should be a high or very high priority for the president and Congress, including more than eight in ten Democrats (84%), but only four in ten Independents (41%) and one in four Republicans (24%). Liberal Democrats are more than five times as likely as conservative Republicans to think global warming should be a priority (92% versus 17%, respectively). Go back to 2. Should the United States Act on Global Warming? 2. Should the United States Act on Global Warming? Leiserowitz, A., Maibach, E., Rosenthal, S., Kotcher, J., Goldberg, M., Ballew, M., Gustafson, A., & Bergquist, P. (2019). Politics & Global Warming, December 2018. Yale University and George Mason University. New Haven, CT: Yale Program on Climate Change Communication. The research was funded by the 11th Hour Project, the Endeavor Foundation, the Energy Foundation, the Grantham Foundation, and the MacArthur Foundation.